Rudy Giuliani doesn’t understand crime: The former New York City mayor is misinformed about the facts of black-on-black crime. The former New York City mayor doesn’t know the first thing about the intersection of race and crime. Former New York City Mayor Rudy Giuliani in 2011. His co-panelist, Georgetown professor Michael Eric Dyson, shot back. “[F]irst of all, black people who commit crimes against other black people go to jail. No. 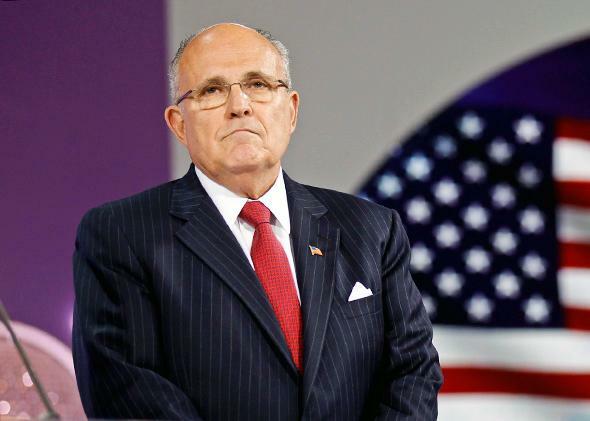 2, they are not sworn by the police department as an agent of the state to uphold the law,” he said, calling Giuliani’s claim a “false equivalency.” He’s right; most black people who commit crimes are arrested and convicted. Most cops who kill innocent people aren’t charged, much less criminally liable, as the world was reminded on Monday night as it watched a grand jury fail to decide that officer Darren Wilson should stand trial for killing Michael Brown. But Giuliani stuck to his guns, and later in the segment, he argued that white police are only in black neighborhoods because of crime. “It is the reason for the heavy police presence in the black community,” he said. “White police officers won’t be there if you weren’t killing each other 70 percent of the time.” And on Monday morning, he went to Fox News to defend his take and tout his record as mayor. What makes this—and Giuliani—unserious? First are the facts of the matter. To start, homicide exists among whites—the third leading cause of death for white men (and fourth for white women) age 19 to 24 is homicide. As for “black-on-black crime,” while 90 percent of black Americans are killed by other black Americans, it’s also true that this high intragroup crime rate isn’t unique—83 percent of white Americans are killed by other white Americans. This is easy to understand. People don’t go across town to steal or kill—they commit crime against their neighbors. And in the United States, where most lives are still segregated by race, that means blacks victimize blacks, whites victimize whites, and so on. Any difference in intragroup crime owes more to levels of segregation—most whites live in places where there are some minorities, most blacks live in places where there are mostly blacks—than it does to any particular propensity for crime. And the idea that blacks don’t care is demonstrably false—black communities are saturated with messages and marches against crime. But those aren’t as interesting as, for instance, the riots in Ferguson. Giuliani’s other assertion—that white police only patrol black neighborhoods because of high crime rates—is also wrong. Heavy-handed policing in black neighborhoods—by predominantly white departments—goes back to the middle of the last century and was a key factor in the riots that rocked the urban landscape in the 1940s, ’50s, and ’60s. More importantly, this policing predates the high crime rates that Giuliani cites as justification. Of course, this is Giuliani’s modus operandi. The former mayor built his career on scaring white New Yorkers with fears of black criminals, to the point where he can’t help himself; while campaigning for Michael Bloomberg in 2009, he warned that New York City would go back to the way it was if voters made the wrong choice. “You know exactly what I’m talking about,” he said during a campaign event. “This city could very easily be taken back in a very different direction—it could very easily be taken back to the way it was with the wrong political leadership.” In this case, the “wrong political leadership” was the city comptroller, Bill Thompson, who is black. But even if Giuliani is banal, he’s still worth debunking, not just because he’s wrong, but because he’s honest. There’s no subtext to his remarks. When he tells a Fox News panel that “there is virtually no homicide in the white community,” he’s explicitly connecting the whole idea of crime to black Americans. In Giuliani’s rhetoric, the crime problem is a black problem. The difference, as Khalil Gibran Muhammad notes in The Condemnation of Blackness, is that then the alleged preponderance of black criminality was used to justify neglect. In cities like Philadelphia, politicians attacked vice and crime in white neighborhoods while ignoring it in—or even it directing it to—black ones. Now, it’s justification for constant police contact and its inevitable, often violent, consequences. None of this is to deny that black communities have more violence and more crime than their white counterparts. It is true. And indeed, blacks are more likely to face criminal victimization—up to and including murder—than any other group. But it’s wrong—morally and analytically—to treat these facts as racial problems inherent to black people or any particular aspect of blackness. That’s what the idea of “black-on-black-crime” does: It collapses a whole world of distinctions, circumstances, and situations into a single frame, where crime in Prince George’s County, Maryland, is the same as crime in Gary, Indiana, is the same as crime in Houston, and all are part of a nebulous “black crime” problem. Indeed, to rely on the idea for any explanatory power is to embrace racist mythmaking while disavowing any responsibility for the existence of impoverished, high-crime black neighborhoods. Or, to make that more concrete, we need to consider all other options before we attribute high crime in black neighborhoods to “culture” or some inherent black criminality, especially given the long abuse of “culture” as an explanation for perceived black inferiority. We need to account for the effects of hypersegregation and broad, concentrated poverty. We need to account for the collapse of urban economies and the presence of illicit drug markets. We need to account for the huge, heavy-handed police presences that lead to more crimes being caught and more actions being classified and treated as crimes. And we need to account for the real effects of public policies like the war on drugs and mass incarceration on violent crime rates. “Without the War on Drugs, the level of gun violence that plagues so many poor inner-city neighborhoods today simply would not exist,” notes Heather Ann Thompson for the Atlantic. “The last time we saw so much violence from the use of firearms was, notably, during Prohibition.” It’s only when we consider these factors that we can bring culture and alleged criminality into the picture. Anything else is dishonest and treats black Americans as a dangerous exception, not part and parcel of the country’s fabric. Crime is complicated. We have ideas of how to reduce it on a local or community level, but we’re limited when it comes to a systemic view. Even now, criminologists aren’t sure what caused the rapid declines of the past 20 years, which lowered crime rates across all groups and all communities. But we know this: Ideas of black criminality—of “black-on-black crime” as a particular phenomenon—have a specific origin in the racist miasma of the post-Reconstruction United States. They were built with marginalization in mind—to justify racism, disenfranchisement, and neglect—and they persist like The Thing (John Carpenter’s, not Jack Kirby’s), strong, adaptable, and embedded in the national mind. But that doesn’t mean we have to indulge them. We can talk about crime and crime control without demonizing an entire class of people. And indeed, with the consequences of those myths in full view in cities as different as New York, Ferguson, Saratoga Springs, and Cleveland, we have no other choice but to talk differently and try to change our image of what crime looks like. Lives depend on it.